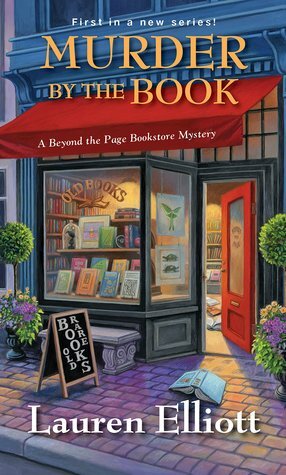 Murder By the Book is the first book in the Beyond the Page Bookstore Mystery series by Lauren Elliot. Addison Greystone inherits her great aunt's estate which includes a home and a number of books. She moves from Boston to the small seaside town of Greystone Harbor, and opens an bookstore. From her first day, mysterious things happen. When her friend is arrested for the murder of another merchant, Addie must use her sleuthing skills to find the real killer. I enjoyed this book tremendously. The characters are fun, witty and very relatable. I could see myself browsing in Addie's shop trying to find just the right book. I want to visit Serena's tea shop for a cup of tea and something to nosh on. The small town setting adds a quaint, homey feel to the story. The mystery is wonderful and filled with intrigue. I had a hard time putting this book down. I wanted to keep reading to see how all of the pieces would fall into place. There are twists and turns throughout the story. It held me in its grasp and kept me guessing until the very end. I can't wait for the next book to come out to see what other adventures Addie has. I would recommend this book to anyone who loves a mystery that grips you and doesn't let you go until the end. There are great characters and a hint of romance with a small town sentiment that will make you feel at home. I received this ARC cop of the book for review from the author.